A sports hernia is probably the least understood of all the injuries that involve professional level and collegiate level athletes. A sports hernia is a tear to the oblique abdominal muscles. Unlike a traditional hernia, the sports hernia does not create a hole in the abdominal wall. As a result, there is no visible bulge under the skin. This means making a definitive sports hernia diagnosis is difficult. It is not uncommon for one of Dr. Brown’s patients to have seen four or five other consultants prior to seeing him. The athlete is often given the diagnosis of a groin strain and is told to rest and that the problem will go away. And it does for a while, but the pain associated with a true sports hernia will return with a vengeance once the ibuprofen wears off and activity resumes. Failing to understand the underlying issues surrounding sports hernias results in chronic pain for the athlete and an unnecessary delay in diagnosis and treatment. Any athlete who suffers chronic groin pain that is aggravated by sports and is relieved by rest should be strongly considered to have a sports hernia. How Do Sports Hernias Occur? A Sports Hernia occurs when the muscles in the inguinal region or groin are injured or torn. This causes weakness and pain. Look at the image below and visualize the anatomy in your mind. The Rectus abdominis muscle attaches to the superior aspect of the pubic bone and next to the Rectus abdominis the Internal and External oblique muscles also attach to the superior aspect of the pubic bone at the lacunar ligament. When the Rectus abdominis contracts the pubic bone is pulled up. When the oblique muscles contract the pubic bone is pulled upward and to the side. The Adductor longus muscle attaches to the inferior aspect of the pubic bone just below the attachments of the Rectus abdominis and the oblique muscles. 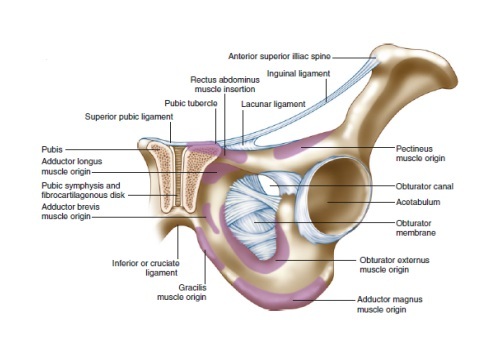 When the Adductor longus contracts, the pubic bone is pulled down and to the side. When the abdominal muscles (Rectus abdominis and the oblique muscles) and adductor longus muscles contract at the same time there is a tug-of-war with the pubic bone in the middle. The adductor muscles are stronger than the abdominal muscles and so the adductor usually wins the tug of war and the result is for the Rectus abdominis or the oblique muscles to tear. Occasionally the adductor tendon will be injured at its origin. And rarely the pelvic bone itself will be injured at the pubic symphysis resulting in osteitis pubis. Sports hernias occur most commonly among professional athletes, specifically football, hockey, soccer and tennis players. However, weekend warriors and athletes making extreme and repeated twisting-and-turning movements are also susceptible to a sports hernia. Many doctors in the United States do not believe that a Sports Hernia is a real injury. Most insurance companies use that fact to deny payment for Sport Hernia surgery. Recently the English Hernia Society published a consensus statement based on testimony of the experts stating that a Sports Hernia is a real injury. That it is a common injury among athletes and that surgery is very effective. Please click here to read their consensus statement. Hopefully this strong statement by the British Hernia Society will lead to better understanding in the United States by physicians and insurance companies. Dr. Brown has been performing sports hernia surgeries and providing specialized rehabilitation programs since 1999. His clients include the San Jose Sharks, San Jose Sabercats and the San Jose Earthquakes sports teams as well as athletes from the NFL, AFL, NBA, NBL and the United States Soccer League. Athletes from all over the United States as well as from 15 foreign countries have sought out Dr. Brown's expertise.